Tickets for special grandstand at sector 8, the sector is in the middle of the parade. At this specific position on the sambadrome it is possible to see the parade with greater quality than in the first and final sectors, once it is possible to see the performance since its beginning until its ending. Sector 8 is located in a judge’s area so you can wait for good performances nearby. This is one of the most requested areas by the samba lovers. Sector 8 is also located in front of the second samba percussion area, which makes the atmosphere even more exciting. Due to the difficult access for the even sectors, we recommend our customers to use the subway service or our shuttle service. 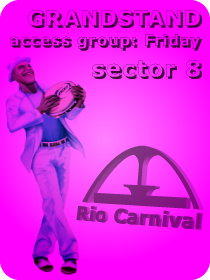 This ticket is valid for the parades of the samba schools from serie “A” on Friday (02-21-2020). Regular shuttle service for sectors 2, 4, 8 or 10 to the Sambadrome with three or four available pick up locations on the seaport or the greatest hotels of Rio de Janeiro (check the hotels list). The transfer back to the hotel can only be made at the ending of each Samba School presentations.